Revange Hydro Pump is a supplement with a complex of ingredients, including six forms of creatine (anhydrous, hydrochloride, malate, pyruvate and citrulline), glycerol monostearate, ascorbic acid and salts of essential microelements (magnesium, sodium and potassium). Creatine is a natural tripeptide whose main task is to store energy needed by cells with high metabolic activity to function. A blend of its forms is aimed at maximising its anabolic effect. Glycerol monostearate is the glycerol ester of stearic acid which is formed in the body during the process of fat digestion. It is believed to have the ability to hydrate muscle cells which contributes to an increase in muscle efficiency and size. Ascorbic acid is the popular vitamin C required for processes of formation of collagen which is a building block of bones, cartilage and joints’ connective tissue. In addition, it is involved in the synthesis of adrenal catecholamines. Magnesium, as the most popular supplemented substance, helps regulate processes of glycolysis and DNA synthesis. Most importantly, as an antagonist of calcium, it allows you to avoid involuntary muscle contractions. The content of two forms (citrate and carbonate) ensures high absorption and desired efficacy. Sodium is an essential microelement which helps maintain normal blood pressure and is also responsible for the body’s hydration and nerve and muscle function. As sodium citrate, it is likely to prolong the shell life of a product. Potassium, found mainly in intracellular space, is, along with sodium, is a “guardian” of normal function of nervous and muscle tissue – especially cardiac muscle. Potassium chloride is the most popular form of this element which is characterised by high bioavailability. In the human body, creatine is synthesised from three amino acids, mainly in the liver, kidneys and pancreas. Subsequently, it is distributed by the circulatory system to metabolically active tissues, among others, muscle and nervous tissue. Its main task is to store metabolically useable energy in its phosphorylated form – phosphocreatine. By donating its phosphate group, it helps form a molecule of ATP – an energy carrier which participates in muscle contraction and protein biosynthesis in muscle skeletal cells. It has been demonstrated that creatine has a positive effect on muscle strength and mass. In individuals supplementing with this tripeptide for 8 weeks, there was a noticeable increase in weights on average by 9 kg. This is often accompanied also by enhanced muscle hypertrophy via two mechanisms – by reducing an inhibitory effect of myostatin (a protein which inhibits muscle cell growth) and stimulating processes of protein biosynthesis (due to the activation of intracellular signalling cascades, among others, MAPK and ERK). Since neurons are also metabolically active, they may also contain creatine. It protects the nervous tissue and is also believed to improve memory processes and inhibit the development of depression. Muscles are very “fond” of an aqueous enviroment. Glycerol monostearate helps maintain proper muscle hydration. It facilitates water absorption into skeletal muscle cells which is visible as increased muscle size. Ascorbic acid is another name of vitamin C – a compound which is alleged to have a range of benefits. Its most important function in the body is that is it is involved in the synthesis of collagen, specifically two amino acids that build it – hydroxyproline and hydroxylysine, which are critical to its normal structure. Collagen is a building block of, among others, bones, cartilages, connective tissue proper (found in ligaments and tendons) and is a component of the skin. Because of that, the presence of vitamin C determines normal structure of these tissues. The impact of ascorbic acid on hormonal balance is also important. The synthesis of catecholamines (dopamine, noradrenaline and adrenaline) takes place in several stages and one of them requires the presence of vitamin C. The synthesis of noradrenaline and indirectly adrenaline will not be possible without it. In addition, it is worth noting that consuming zinc and iron in combination with ascorbic acid improves their absorption from the digestive tract. Since it is an antioxidant, it may inhibit the development of cardiovascular diseases and formation of gall stones. The most significant microelements found in transcellar fluid in the body are sodium, potassium and magnesium. The most important cation in the extracellular fluid is sodium. Its main function is to maintain normal volume of the fluid. An excess or deficiency of this microelement results in hyperhydration or dehydration respectively. Normal sodium and potassium levels are also vital to normal functioning of muscles and nerves because changes in their concentration in both sides of the cell membrane are a prerequisite for proper neurotransmission in nerve-nerve and nerve-muscle synapses. Unlike sodium, potassium cations are found inside the cells and are equally important to nerve-muscle transmission. This applies especially to cardiomyocytes – the heart is sensitive to changes in its concentration (it may lead to cardiac arrest). Kidneys are more likely to excrete potassium cations than sodium ones and that is why it is crucial to monitor them and supplement with this element. Magnesium supplementation is associated with the prevention of excessive muscle cramps. This theory is valid because magnesium cations are antagonists of calcium cations, whose excess is responsible for increased neurotransmitter secretion in the neuromuscular junction and thus causes an increase in abnormal muscle contractions. What is more, these cations are involved in the pathway of glycolysis, synthesis of nucleic acid and stabilises blood platelets, thereby preventing their abnormal coagulation. 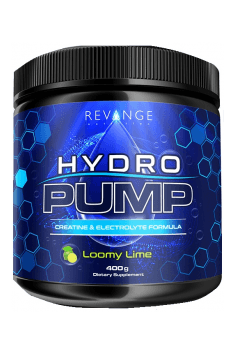 To sum up, Revange Hydro Pump is a supplement designed for very active beginners in strength sports who want to maximise their athletic performance and increase muscle mass. This “anabolic complex” should be considered by individuals willing to get a more intense muscle pump and also who lose a lot of water and valuable electrolytes during workouts. Mix 1 scoop (8g) in 240 ml of water and drink directly after exercise. Mix 1 scoop (8g) in 240 ml of water and drink in the morning. The supplement is designed for persons who are prepared for very demanding workouts. It will allow them to meet requirements for basic microelements depleted during physical activity, hydrate and partly maximise strength and gains in muscle mass. It should be taken by individuals who complain about the lack of a “pumped feeling” during training. Electrolytes combined with creatine and glycerol monostearate contribute to better muscle hydration and consequently a stronger pump. I think that the dosage recommended by the manufacturer is the most optimal because I use creatine in a similar concentration and this ensures, in my experience, the desired effects. REVANGE Nutrition is a brand of innovative dietary supplements for athletes and physically active people. They are characterized by a new higher quality, thanks to the pharmaceutical perfection of a production process and high efficiency, which is confirmed by numerous certificates: GMP, GHP, HPLC Ultra Tested. Natural flavor, sucralose, citric acid, magnesium carbonate, silicon dioxide, natural color.